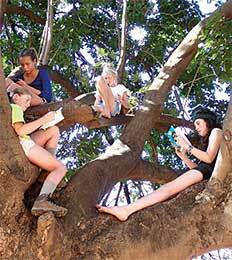 Back in 1958 the renowned conservationist Ian Player ran the first-ever trail for high school students in Imfolozi. 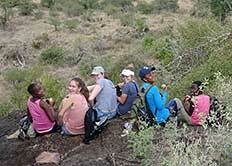 The Wilderness Leadership School later facilitated fully sponsored school student (and other) trails. Time to pay back and take further. Since 2013, Discovery Trails has been sponsoring meritorious students to come on trail. 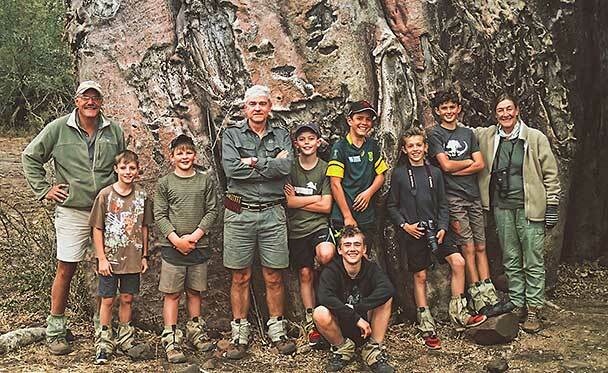 The idea is to provide the right kids with a riveting but safe wilderness experience, at the earliest age that Kruger allows for walking trails. The first dedicated, students-only sponsored trail, drawn from Grade 7 students (aged 12-13), was conducted in 2016. 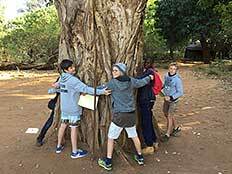 The students came from St Johns, Jan Celliers, Parkview Senior Primary (Gauteng) and Ridgeway Independent (Louis Trichardt/Makhado). 2017 saw the first girls trail, with participants from Auckland Park Prep, Parkview Senior Primary, Ridgeway Independent and Makuleke Primary. Southern Cross Schools in Hoedspruit debuted as well, on the boys' trail. Any student with the right qualities from any school is welcome to apply for a place on a sponsored trail (enquiries@discovery-trails.org). Extra guide resources and other measures are introduced into these trails to promote the safety and welfare of the participants. For a fuller picture, see the essay First Contact: Wilderness Greenshoots. "I think that by coming here we learned so much about nature and the wild, and everyone has learned more about the wilderness as a whole. I think this has inspired us to conserve this amazing place so that future generations can see and learn about this beautiful and magical place and see what we have seen on this trip. I think that this experience has showed us what our future could be like and paved the way to the future of this amazing place. I would be proud to say that my legacy has created a better tomorrow for everyone and every living thing. I will remember all the beautiful landscapes, and all the wonderful people I met on this trail! Seeing all these animals on foot was magical, I have never experienced such magic and thrills ever before." "I cannot believe how excited my daughter was after her trail. She has gained the most amazing knowledge and has certainly gained in life from the new friendships. I have never seen her so animated and excited about new recipes she learnt out of the bush kitchen, the sighting of the white-tailed mongoose, the hyena encounter, baobab stories, the racquet-tailed roller sighting - and her stories keep coming out. Her most amazing experience was the half-hour solitary reflection, taking in the sights, smells and sounds. She said she understands how and why the bush is so therapeutic and she would love everyone to be able to experience this - very touching, as I relate to this. Thanks for giving her the opportunity to experience true wilderness on foot. 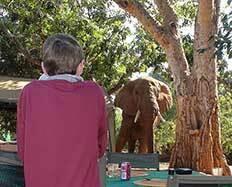 She is now completely captivated ... "
Sponsored trails: Sunday 30 June - Friday 5 July 2019 - A mixed boys' and a girls' trail will be conducted over six days/5 nights at RETURNAfrica's Pafuri Trails Camp on the banks of the Luvuvhu.